Notes in italics from Hampshire and the Isle of Wight by Nikolaus Pevsner and David Lloyd (1967) Yale University Press, New Haven and London. Other information from the leaflet in the church written by C.E. Bassett. 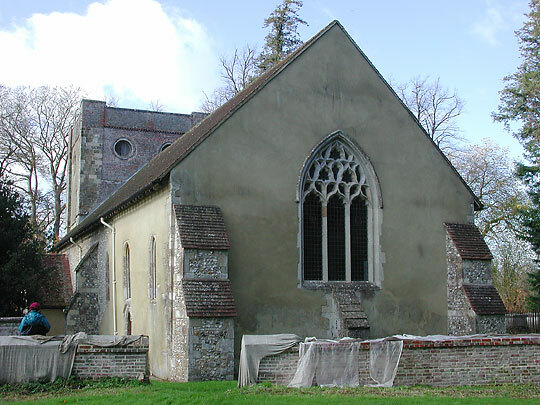 The first church was founded about 682 by Bishop Wilfred and is traditionally believed to have been his headquarters for converting the heathen Meonwara of the Meon Valley. 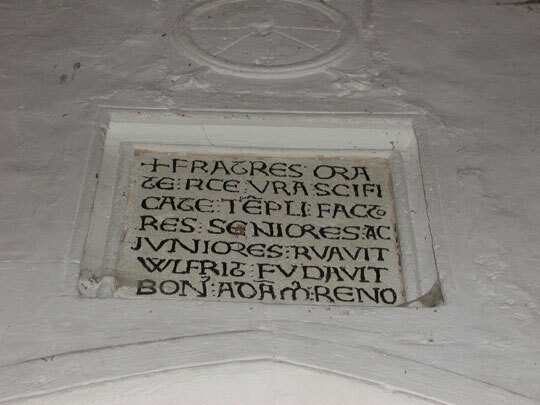 For the historian, the special importance of the church lies in the two inscriptions, in the S porch and on the N side, which tell us that Wilfred founded the church, but that Adam de Port renovated it. 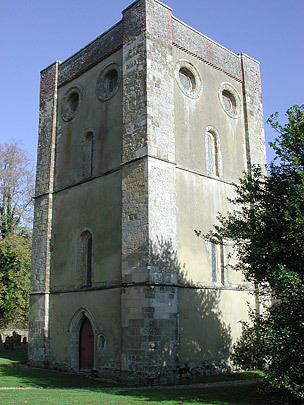 Now Adam de Port held Warnford from 1171 to his death in 1213, and it is quite possible that the tower represents c.1175 and the rest c.1210. "Brethren, bless in your prayers the founders young and old of this temple; Wulfric founded it; good Adam restored it." It is undecided whether Wulfric is Bishop Wilfred, the founder of 681, or the Abbot of Newminster (Hyde), Winchester, of 1067-72. "May the race signed with the Cross (i.e. Christians) from the rising of the sun bless Adam de Port by whom I have been thus restored." 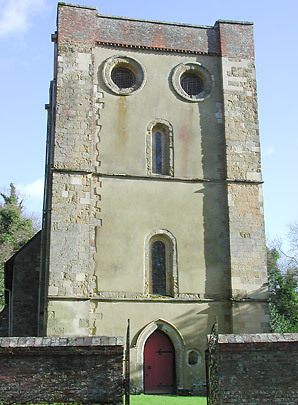 The tower is assertively Norman, broad and sturdy, with clasping buttresses and the bell-openings as pairs of big circular holes. Whilst Pevsner suggests c.1175 for tower, C.E. Bassett states that it may well be as early as 1130. 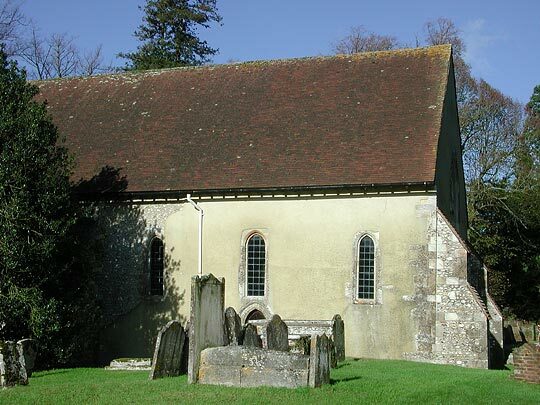 It stands against the west wall of the Saxon church and is built of Quarr stone from the Isle of Wight. The brickwork at the top is a rebuilding of 1752. Nave and chancel (in one, without a chancel arch) have lancets, the S doorway and the priest's doorway are pointed and have slight chamfers, ..
.. and even the tower arch - a later widening? - is pointed, though it has only a one-step profile. But what does the large blank round arch round the early C14 E window mean? The window is of three lights and has quite enterprising flowing tracery. 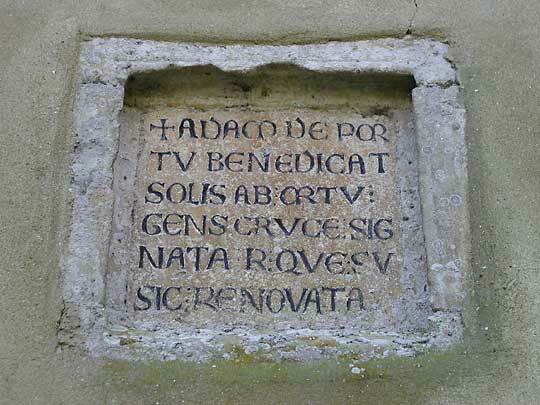 The window was inserted in 1377. 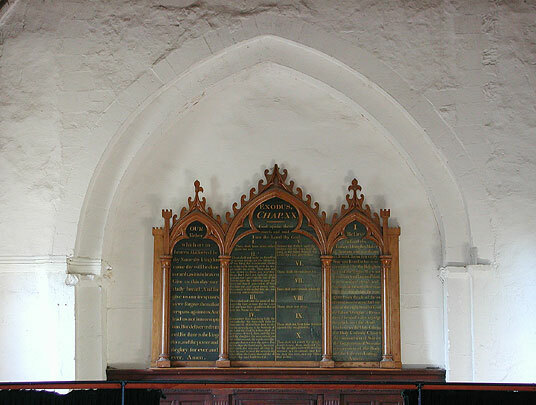 Jacobean chancel screen of 1634. The hanging rood of 1938 is by Martin Travers. 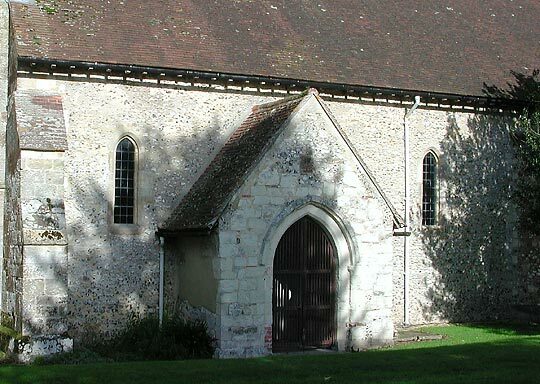 The buttresses to the chancel are of 1906. 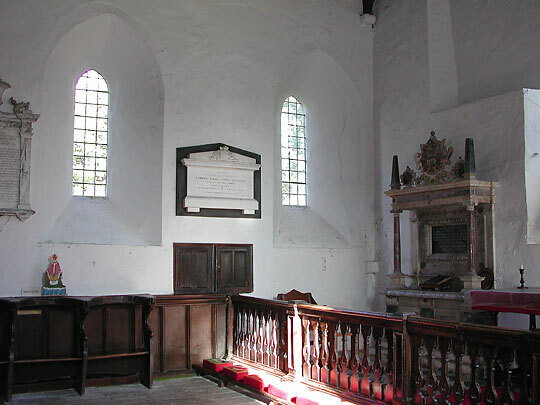 Chancel, north-east corner. 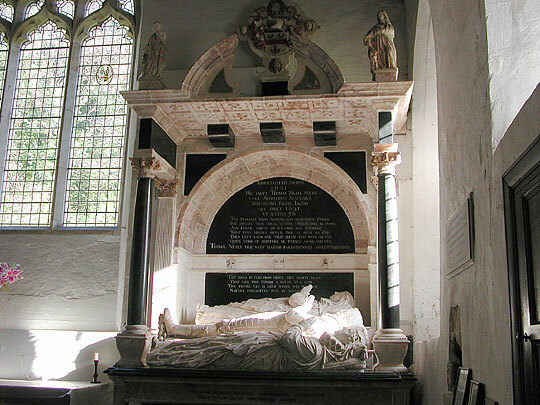 Alabaster monument to William Neale, died 1601, and his two wives. 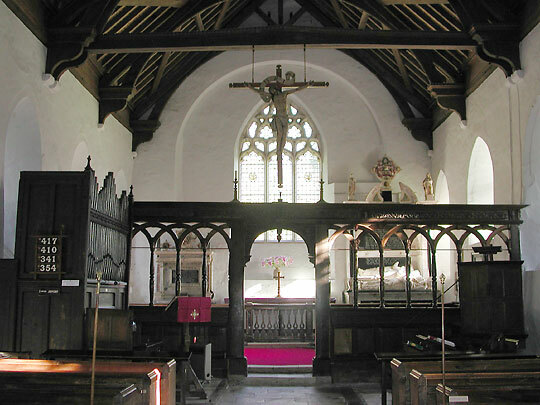 Chancel, south-east corner. Alabaster monument to Sir Thomas Neale, died 1621, with two wives. He was the son of William Neale. 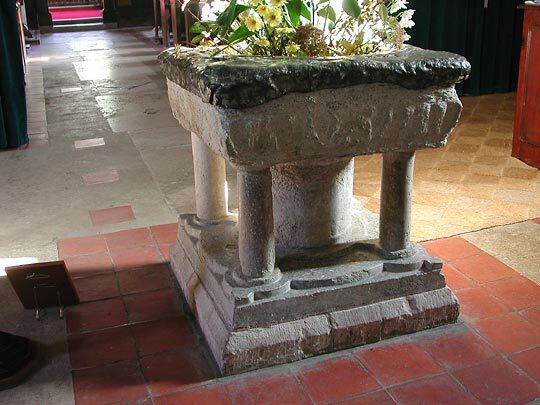 Font from about 1130, of Purbeck stone. Carving is still just visible on the sides. Sundial in the porch. Is it E.E., see the stiff-leaf spreading into the corners of the square panel? 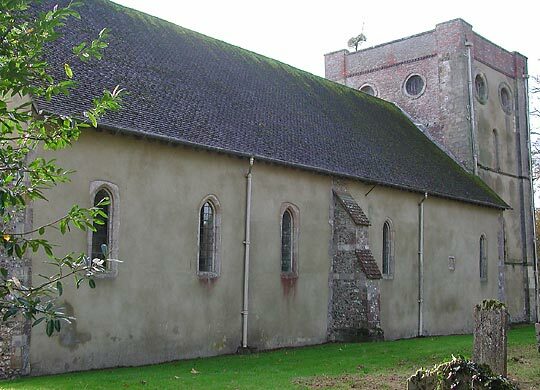 Or can it be Saxon, like that at Corhampton? A few yards beyond the east end of the church are the ruins of St John House.